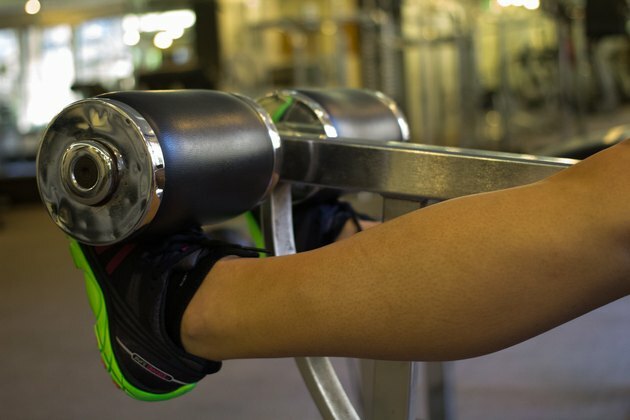 What Muscles Does the Leg Curl/Extension Machine Work? Keith Tesch started his professional writing career in 2010. He holds a Bachelor of Science in exercise and sport science from the University of Wisconsin, La Crosse and is certified as a strength and conditioning specialist. A trainer may send you to the leg curl or leg extension machine to work your legs. These two machines work the opposing sides of your thighs. Use a leg curl machine to load the muscles in the back or posterior of the leg, primarily the hamstrings. The leg extension machine has you straighten your leg against resistance and thus works the muscles on the front or anterior of the leg -- your quadriceps. When using either the seated or lying leg curl machine, the muscles on the back of the thigh contract to bend your knee. The hamstrings are made of three muscles: the biceps femoris, the semimembranosus and the semitendinosus. The largest of the three is the biceps femoris. The quadriceps muscles are engaged when you use the leg extension machine. These muscles consist of the rectus femoris, the vastus lateralis, the vastus medialis and the vastus intermedius. During this exercise, the rectus femoris is the most-worked muscle. At the end of the motion, when your knee is almost straight, the vastus medialis then contracts. The calf muscles are made of two muscles, the gastrocnemius and the soleus. But the one that is used the most during a leg curl is the gastrocnemius, which is most superficial. It crosses the back of the knee and helps the hamstrings to bend the knee when using either of the leg curl machines. When using any machine, it's important to keep proper form. Avoid straightening your knee completely when using the leg extension machine because it can create a shearing force on the knee. This can damage the tissue surrounding the knee. Use weight that's challenging, but not so challenging that your form falls apart. Weight that's too heavy on the leg curl or leg extension can cause you to hitch up through your pelvis and back. This puts you at risk of injury and diminishes the effectiveness of the machines to target your legs.